An article in Quartz illustrates the way that midwives are trying to rewrite the history of childbirth. The piece, entitled The reason American women over-medicalize childbirth has its roots in racial segregation, by Annalisa Merelli is pure, unadulterated nonsense. There were three reasons obstetricians and hospitals came to dominate childbirth in the industrialized world and racism isn’t among them. First, obstetricians and hospitals could offer safe effective pain relief for the agony of childbirth. Second, hospitals offered women something that midwives could not: an opportunity to rest and recover from childbirth without having to care for their husbands and older children. Third, and most important, obstetricians and hospitals made childbirth dramatically safer. The difference between safe childbirth and dangerous childbirth is not midwives; it’s the routine interventions of modern obstetrics. Let’s face it: midwives presided over childbirth for literally thousands of generations and they didn’t make a dent in astronomical rates of perinatal and maternal mortality. It took obstetricians less than 3 generations to reduce both by more than 90%. Every year in the UK, more than half of babies are delivered with the guidance of a midwife. In Scandinavian countries, it’s more like three quarters, similar to the rate in France. In fact, in these and many other countries, midwives take part in almost all deliveries, as they also assist OB-GYNs in more complicated cases. There’s nothing wrong with properly educated, properly trained midwives. They can provide excellent care but ONLY if they follow the principles of obstetrics and medicine elucidated by doctors and scientists. Childbirth is not inherently safe; it is exceedingly dangerous (as it is among nearly all higher order mammals). Dangers include hemorrhage, infection, pre-eclampsia and obstructed labor among others. The difference between safe childbirth and dangerous childbirth is not midwives; it’s blood transfusions, antibiotics, anti-seizure medications, easy access to Cesarean and anesthesia. How many of those innovations were discovered or invented by midwives? ZERO! What about the so-called problem of over-medicalization? It’s much more of an economic problem for midwives than a health problem for mothers or babies. In fact, it’s such a problem for midwives that they have resorted to demonizing whatever it is they cannot do. They can’t offer epidurals or C-sections so they insist they are unnecessary. They require a doctor’s supervision to use blood transfusions, antibiotics and anti-seizure medications so they pretend they are rarely needed. The AMA’s focus on specialized healthcare wasn’t limited to childbirth—it was spread across all disciplines. But its expansion into childbirth was especially effective, partly because the midwives who were, until then, running childbirth were overwhelmingly African American and Native American—both demographic groups that were easy to discredit in a country that had abolished slavery just decades before, and would enforce racial segregation for decades to come. Midwives were overwhelmingly African American and Native American? What drug was Merelli smoking when she wrote that nonsense? And do the folks at Quartz bother with fact checkers or do they just publish whatever drivel their journalists fabricate? Only a foreign journalist could have blithely accepted the falsehood that the overwhelmingly white population of the US allowed their women to be attended in birth by African Americans and Native Americans. In many states, there were and to this day there are few African Americans and even fewer Native Americans. The claim is absolutely ludicrous. Sure midwifery remained popular with African Americans far longer than for white women, but that was because black Americans were denied access to the lifesaving technology of hospitals as a result of racism and poverty. There was no Medicaid or welfare; you couldn’t go to a hospital unless you could pay for it. Sadly, the same dynamic still exists today. Black women and babies are dying in childbirth at far higher rates than other minorities because they LACK access to high technology care, not because they have too much of it. Joseph is not from the US, either, or she would be aware that slavery was ended in abolitionist states long before the advent of midwifery and that many states had few African Americans at all. Only 4% of midwives are black? That’s hardly surprising for two reasons: only 11% of the country’s obstetricians are black as a result of a legacy of racism. More importantly, midwifery has become associated with privilege. Midwives promote natural childbirth and the refusal of interventions. You have to be privileged to have easy access to hospital technology before it becomes a status symbol to refuse it. The bottom line is that the decline of midwifery in the US has NOTHING to do with racism and everything to do with women wanting access to the safest possible care and the availability of effective pain relief. When women are allowed to choose their care providers, instead of having them forced upon them by the government, they prefer obstetricians and hospitals. “BirthSpace: An evidence-based guide to birth environment design”). Another current issue in maternity care is maternal mental health; with postpartum PTSD being prevalent in around 10% of all mothers (evidence: https://www.psychiatryadvisor.com/anxiety/postpartum-ptsd-affects-many-women/article/661356/). A traumatic birth and postpartum PTSD have been linked and for many people the hospital environment is not a positive one. Midwives offer professional and emotional support they are highly trained and will practice independently if there are no extreme complications, this can help mothers who’s are experiencing anxiety. Also, because these birthing units are attached to hospitals if there are any complications requiring an emergency c-section or if a mother wishes to have an epidural this can happen in a very small amount of time. This is a safe environment for both mother and baby that caters for both the physical AND mental wellbeing. Women of African descent have higher mortality wherever they live. The countries that do better than the US are whiter than the US. Where is the evidence for this? Has there been a definite link between African genetics and maternal mortality? According to the UK Confidential Enquiries into Maternal Deaths and Morbidity, Black women in England had over 4x the maternal mortality of white women in 2013-2015. Whether it’s genetics, racism, or a combination, midwives aren’t helping. I have a Brit friend who had standard Brit midwifery care for her pregnancies and births. They talked her into a traumatic birth for her second with their Nacheral Is Better mantra, so bully for them. Literally. I hadn’t seen those statistics so thank you for sharing. It’s awful that your friend had a traumatic experience for her second birth. However, midwives are only supposed to offer information and allow the mother to decide. Not all people will have positive experiences with midwifery-led care but this does not mean that there are not benefits to it. 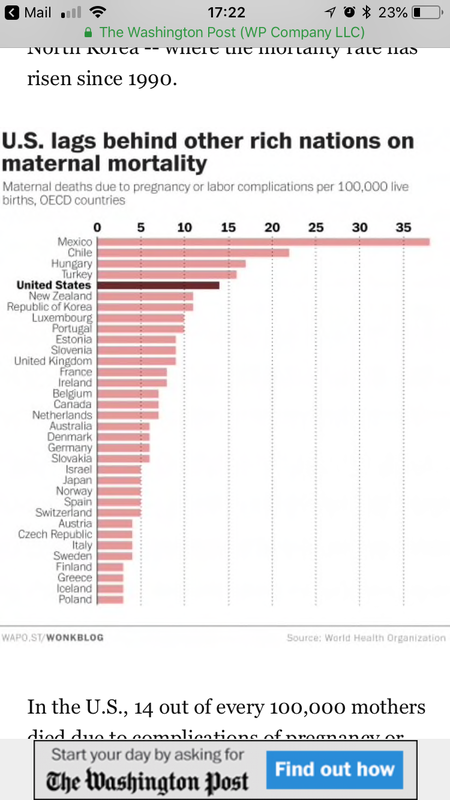 In the same way, many American women are given unnecessary C-sections which are traumatic and as it is a major surgery, resulting in an extended recovery period (evidence: https://www.thebump.com/a/c-section-rate-problems). It is an incredible procedure which saves many lives but isn’t always necessary. People can have negative experiences in any country as not all healthcare professionals will stick to guidelines. I’m simply stating that I believe that there are benefits to midwifery led care in low risk pregnancies. This is a board for grown-ups. You want to make a scientific claim, you can back it up with scientific papers. A pop website that alludes to a WHO guideline that was subsequently withdrawn due to an utter lack of evidence supporting it impresses exactly no one here. Yes, sure, recovery from C-sections take time. If a baby gets hurt because something terrible happened during a low-risk birth, that might be years and years of consequences. You’re right, I was wrong to state that many women are given unnecessary c-sections in America as I do not have the data to back it up. But this was not my original point. My original point was that a midwife led birthing centre in the UK can offer a safe and relaxing environment which has been linked to a good outcome and positive birthing experience. A positive birthing experience is associated with good postpartum mental health. It also offers access to obstetricians who can perform any necessary procedures. In a emergency situation there is immediate access to obstetricians. I believe there are benefits to midwives and obstetricians working together in this way. I am not stating that it always works like this in all hospitals in the UK because it doesn’t. There is nothing truly safe and relaxing about a medical situation which might turn deadly in minutes. Midwives can’t promise a positive birth experience, because sometimes things go horribly wrong beyond their control. It also offers access to obstetricians who can perform any necessary procedures. Only if the midwives decide that the OB’s help is ‘necessary’. A “lethal mix” of failings at almost every level led to the unnecessary deaths of one mother and 11 babies in the maternity unit of a Cumbrian hospital, according to an independent report…Work inside the unit was found to be “seriously dysfunctional”, with poor levels of clinical competence, extremely poor working relationships and a determination among midwives to pursue normal childbirth “at any cost”. A thousand times this. No one can guarantee anything in a fluid medical situation. This is why I find the rise of the ‘birth plan’ which evolves into a set of impossible requirements so damaging. Midwives being powerful enough to exclude doctors is an utter scandal and heads should be rolling over that alone, even were there not the tragedies and disasters that followed. They’re supposed to. In reality, it is very common for them to downplay the risks of vaginal births while over-playing the risks of C-sections, both personally and in outreach (including social media), which makes it very difficult for women over there to make informed decisions. Tell us how you know that ‘many’ women have them. Extended compared to what? What are the short- and long-term risks of a prelabor C-section vs an attempted vaginal birth? “The hospital environment is not a positive one” It’s a positive environment if you want an epidural. And some of us are perfectly comfortable in the hospital. I am so glad that I found your website! I am a former NICU Respiratory Therapist turned teacher. I’ve had several well meaning friends try to talk me into either having a home birth or birthing in a birth center. It’s been 6 years since I worked in the medical field, but my time as an RT definitely left an impression on me regarding how our baby will come into the world….in a hospital. I always tell people that I don’t feel comfortable having our baby at home or at a birth center, because it’s too much of a risk. I always get the same response “well, I wouldn’t have done it if the hospital wasn’t down the street for emergencies.” I think the thing that a lot of Mom’s don’t realize is that down the street is too far if something goes wrong. Babies can go bad so fast! Odds are your midwife is not going to know how to intubate your baby or how to bag them properly. It’s not something that you learn by going to a CPR class. Most people I’ve worked with had to practice intubations for a while before getting it down. But the great thing about hospitals is that they’ve got a NICU team with lots experience in these situations– RNs , RTs, and a neonatologist who has probably been intubating babies for like 30 years, and he or she will be just down the hall more than likely. It just blows my mind why anyone would decide to take the risk. I have noticed though that a lot of my friends seemed to have been given a lot of misinformation from websites, documentaries (The Business of being Born) , so I think they are genuinely scared that their Dr. is going give them a C section when it’s not medically necessary. It is my hope that websites like yours will help to educate women like my friends so that they aren’t so fearful of the medical community. I just feel like they’ve been lied to about so much. Welcome…and I think part of the problem is that a lot of women believe that “an unnecessarian” IS the worst thing that could happen. They’ve never known anyone who’s lost a baby, or any women lost in childbirth…because we live in an age where OBGYNs and NICUs are a thing. Modern OB care is a victim of its own success…people have forgotten how bad “bad” can be. Oh yes, I totally agree! A lot of women with that mindset seem to think that a C-section is always bad and it’s just a way for their Dr. to get to go on vacation early or something. It’s really quite sad that they believe this. You are so right! They really don’t understand just how bad things can get. It’s a cult. Two days ago I was called to the ER to see a homebirth midwife patient who presented at term (fifth baby) with shortness of breath. Long story short: she was in fulminant congestive heart failure with cardiomegaly and pleural edema (peripartum cardiomyopathy). People do die from this, and my counseling regarding what she needed stressed that her own death was a very real possibility. We did the c/s promptly (they always improve after delivery and the baby can’t tolerate hypoxia either) and mom was transferred to the cardiac unit, where she started talking about planning her VBAC no less than 12 hours later. I wish I were kidding. There’s no getting through to some people. I am not a doctor, but I have spent enough time here to ask- once that’s happened once, isn’t there a massively heightened risk for that sort of thing to happen in subsequent pregnancies? oh yes. Pregnancy is very hard on the heart; it pumps twice as much blood (compared to the non-pregnant heart) per minute, every minute of every day for ten lunar months. This is an older mom, too, with some other medical problems. She insists she is healthy. It borders on psychosis. There she is, in the cardiac ICU blithely discussing her future childbearing plans. At her age I had a scary bout of HELLP and swore off more kids because I thought my first responsibility was to not leave the ones I had without a mother. What a mindset-ebil doctors will swoop in and fuss and everything will be alright. Lots of discussion today in the UK about the stillbirth rate and how we have to improve. Waiting to hear how the Royal College if Midwives respond, especially given that the figures are 80% of intrapartum stillbirths could be prevent by better monitoring (continuous CTG and not intermittent auscultation) and earlier intervention. Damn that medicalization of childbirth, how dare we interfere with Nature! What percentage of stillbirths are intrapartum? I figure that most sillbirths are goners on arrival at the hospital. All the news has been about this report from MBRRACE-UK, I’ve only read the summary so far. They don’t make it easy to understand, given that for the intrapartum death rate they include babies who are liveborn but who die in the first week, and everybody else would call those early neonatal deaths. What, exactly, are those ‘myriad problems’, how are they ‘stemming from the over-medicalization of childbirth’, and is that even a thing? Are they worse problems than the death of infants or even mothers? I have considerable health problems, and no doubt someone could look at the number of medications I take each day and say that I’m over-medicalised. It is true that without them I wouldn’t be in the poor health column; but that is because, without all the medications and surgeries, I’d be dead. the nose pads on my glasses make me break out on the bridge of my nose. clearly, glasses are a medical intervention that has a negative impact on my health. yep. You should have just trusted eyes. Don’t you know nature designed your eyes perfectly for seeing? “I need my glasses,” said no caveman ever. What does one do when they feel guilt for choices made in pregnancy or their child’s early life. I recently had my son, and had gestational diabetes during that pregnancy. It seemed easy to manage with diet, and I scarcely had a high reading. My obgyn told me to stop checking so frequently but I ignored her and checked anyway. After my son’s birth he had low sugars and needed a nursery admission to stabilise them. He wasn’t oversized at birth or anything else that might have demonstrated poor control. I don’t know why his sugars were low if my control was good – and so feel guilty (still) for the fruit juice I drank in labour and whether that did it. Any advice on how to move on and stop blaming myself? I have known several women who had GD during pregnancy. Some were overweight, some were skinny, some were vegetarian, some were cake lovers. The only common denominator was pregnancy. There’s nothing a woman does “wrong” to bring on GD! And slightly low sugars after birth can happen with or without GD. It sounds like you managed it remarkably well; no worries! A lot of things are outside of your control. Period. Remember that a lot of medical advice is focused on managing risk, not eliminating it; you can do everything “right” and still have something bad happen. It sounds like you were scrupulous about managing your gestational diabetes, and really have nothing to blame yourself for. If your kid develops food allergies, it’s not your fault; if your kid gets ear infections frequently, it’s not your fault. Hang in there, and congratulations on your lovely son. This is not your fault. You did everything possible to keep your blood sugar under control, and it sounds like you were very successful at it. A drop in blood sugar after birth is a very common issue with GD, and it sometimes happens even without GD, just because it’s difficult for a baby’s body to adjust to life on the outside. The important thing is that the low sugar was detected and corrected before your child could suffer any complications. There is absolutely nothing you could have done differently-you followed medical advice, you modified your diet, you checked your readings regularly. You aren’t responsible for what your pancreas did, and you’re not responsible for your wee boy being admitted. It just happens, honestly. GD is so variable, and babies reactions vary, and you couldn’t have changed thst. Glad that both of you are fine now, enjoy your baby and try to not dwell on what can’t be changed. If it helps, think of it this way; if low blood sugar, promptly detected and treated, is the worst health problem your kid has in their first year, things are going really really well. Yeah, funny how she forgot to mention how high the infant and maternal mortality rates were before OBGYN became a thing. We hit a pretty good asymptote between the 50% and 88% line. Makes me think of the ‘excessive’ ~30% C-section rate. Breech mortality in 70’s was still 1-3%. Term Breech Trial (2000) is responsible for biggest increase in CS globally in our lifetime, and for the reduction of mortality for breech babies down to that of vertex ones. And what’s really mindblowing is this: the midwives in this article think that’s a bad thing. Right? “OMG too many C sections cascade of interventions! !” Like…is *death* better than a c section? Really? Someone remind me again, how did the saying go? Means do not matter at all when the purpose has been lost. Doing lots of genealogy on Polish relatives the last few weeks. It is heartbreaking to read through church records and see a birth or baptism followed days or less than a month later by the baby’s death. Yesterday’s find included a family that had only 3 of 11 children who lived past the first few weeks. They were all midwife attended births. Other family members had multiple babies who were stillborn. Again all midwife attended births. The midwives were listed by name in church records as the witness. And then there were the mothers that died during childbirth or shortly thereafter. It was not unusual for the male relatives to be married 2-3 times, their wives often dying during their childbearing years, including a great-grandmother who gave birth prematurely (baby died) and then died herself, probably from chorioamnionitis. Although to be fair, the deaths of the babies may have had nothing to do mom’s labour and delivery. The midwife connection may not be causal, but it was just there. The other thing is that there may have been a genetic component (that may have died out with those kids because it was either not known about or there was no effective treatment at the time). I won’t even mention epidemics of disease that are now vaccinatable. It’s very likely that there were moms and babies that would’ve survived had they been born in hospital but not all. I am legitimately terrified that by the time I’m having my children, obstetrics won’t be a medical field covered by insurance (or in existence) in the US anymore. It’s an excellent article, but I have one quibble. When you say that “only 11% of the country’s obstetricians are black as a result of a legacy of racism”, I do not doubt that there were racial barriers to black Americans in the medical field, but as the percentage of the whole US black population is only about 13%, isn’t this right about where you would expect the number to be? For sure. I am open to being proven wrong, but I doubt that the whites in slavery-era US were casting about for racial minorities to deliver their babies. The original Boston Colony midwives were all WASPs. It’s not as if GWTW was an even remotely accurate or nuanced view of what life was like for most enslaved people, but I do know that they only sought Prissy’s help out of desperation–Dr. Meade wasn’t available because he was too busy stitching up hundreds of injured men who had just returned from war. (Scarlett’s mother, who was of course, white and upperclass, was the midwife in the movie, but she wasn’t in Atlanta.). Anyway, Butterfly McQueen was apparently a pretty cool lady and loved to act but she felt lousy about the role of Prissy for obvious reasons. I think Hattie McDaniel (Mammy) was similarly conflicted about being constantly typecast as either a slave or a maid but if you were a black woman who loved acting back then, there weren’t any other options. I’m also a crazy fan–though I didn’t get a great first name out of it! Like you I became obsessed with the book and movie before I had a real understanding of racial issues (though I’m always trying to learn more obviously.) I mean, I knew slavery and racism were wrong but I was pretty young and definitely lacking. Watching the movie now is a very different experience. You’ve got a good point about Dilcey being a midwife as well; I’d forgotten about that. I would assume she was only a midwife to other enslaved women; do you remember if it discusses it in any detail in the book? Anyway, though, I gotta disagree with you on Leigh’s performance being lame, but then I am a huge fan of hers. But complete and enthusiastic agreement on McQueen and especially McDaniel, of course! She was a very good actress in other things I have seen her in, I just felt she wasn’t all that great in GWTW, maybe because of her southern accent trying to cover up her English accent. But she absolutely looked the part and was totally gorgeous, so looking at her was a lot less painful than listening to her. I loved her in “That Hamilton Woman,” and she was excellent, so I guess it’s just me being pickey. As far as Dilcey went, I think there was a mention of her delivering the babies at Twelve Oaks, but cannot remember if it was just for the slaves. I do remember that Ellen O’Hara, Scarlett’s mother, delivered Emmie Slattery’s poor illegitimate baby who later died, after Emmie got knocked up by the Tara overseer. Given the attitude of even the slaves toward the Slattery’s, Dilcey probably was considered too good to attend to Emmie, and I think Ellen’s care for the Slatterys was considered an act of charity, one that Mammy definitely did not approve of! I also seem to recall a story about Hattie McDaniel catching some flack later on for portraying a slave/maid, and retorting that she’d damn well rather get paid to act the part of a maid than have to work (and be paid accordingly) as a maid. Which…hey, I can’t really argue with that, especially given the limitations on jobs, whether acting or not, available to black women at that time. Bingo! My mother was born at home and so were 5 of her 8 siblings, but she was delivered by a doctor. The only hospital was too far away (rural Vermont in the 20’s and 30’s). My grandparents got the best medical they could for the time and place and still lost one baby at birth. And I honestly don’t get the thinking that “Oh the hospital is there if we need it and we will get there in plenty of time” either. I prefer to be *at* the hospital in case I need it. But then, I’m a history buff with an emt/firefighter father. I remember being very impressed by an article written for doctors in which they discussed ways to lower their hospital’s decision-to-incision time. It sounded like they were discussing evacuating a crowded building on fire; each minute they could knock off their preparation time was crucial and potentially lifesaving. “Oh the hospital is there if we need it and we will get there in plenty of time”–no. It was amazing how fast my room filled with people once I consented to a c-section (which I did readily – midwife and doctor said we think it’s best and that’s all I needed to hear). Of course my perception of time was altered, but it seemed as if they were hovering outside the door waiting for the signal. Caroline Lovell lived about 12 minutes from a tertiary hospital with ICU and NICU. Probably less for an ambulance on lights and sirens. Of course you also have to factor in the time for the ambulance to get to you (depending on where it is that could be longer or shorter) and time taken to attempt to stabilise you and/or the baby. Yeah I don’t get the ‘plenty of time’ thinking either. Things go pear shaped very quickly, and I’d personally rather have the equipment and personnel there already. I ride a bike to work, and pass the hospital where I gave birth on the way. While a private hospital, they have a well-equipped emergency department that handles a lot of the cases on the western side of the city. One day, right at the corner coming up to the hospital, I another cyclist in front of me crashed, and as he was clearly not well, I stayed with him to help until the ambulance arrived. With the hospital literally at the next set of lights, close enough to see individual employees having their cigarette break at the back entrance, and already past morning peak traffic, it still took 45min for the ambulance to arrive. Granted, it was just a broken shoulder, but a) the ambos didn’t know that beforehand, and b) the poor guy was almost passing out from the pain. In particular, he was in too much pain to walk down the 2 minutes to the hospital. In hindsight, I and the other helpers should have just carried him or stopped a passing car. After this first-hand experience with timing, I’m not touching any “the hospital is X minutes away” plans with a ten foot pole. Yes those timings are dodgy. My friend’s stepdaugher is about to have a homebirth and she believes she is 15 minutes from one of the two big public hospitals in the city, and 15 minutes from a local hospital. She may (or may not) be 15 minutes from one of them but it is physically impossible to be 15 minutes from both, unless you are travelling by helicopter. If only-unfortunately, it’s wishful thinking. Oh wow. Is she in Brisbane, too? Most of the public hospitals here are one well-placed car crash away of becoming almost unreachable by road at some times of the day. I mean, even my “reliably 15-20min by bike” distance (Indro shops to the Wesley) can take anywhere between 8min to almost an hour by car, depending on time of day/night. And that’s pure travel time. I really hope she’ll get lucky and everything works out fine. She is-on the northside. The two hospitals are the Royal, and Caboolture. You see the problem? The roads in this city are a circus. In the bad way. We’re neighbours! I’m in St Lucia, we can’t reliably get to town by road faster than on foot between 4.30pm and 7pm most workdays. I head to the train if in any doubt at all. We’re all crossing everything for her and the little one. Um. Those two hospitals are almost an hour apart, by road, in breezy Sunday traffic. The triangle inequality forbids the existence of a place that’s a 15min ambulance ride from both. And sitting in the middle between them means both are pretty far away… fingers crossed even tighter. I know, right. That helicopter I keep mentioning is the best option-apart from the obvious one of picking one of the hospitals and going there before the action starts. I’d love it. Mishimoo and I mean to meet up, but never do. I’m freshly out of a very difficult workplace so am footloose until Christmas or so. If you have a local favourite coffee shop let’s try that! Got it, thanks! Will message you over the weekend. This is a bit OT, but – I worked at the University of Washington when I was in Seattle, in the Health Sciences building attached to the hospital. I went home via 520 across the Sound, which means I left the neuro lab, turned onto Pacific, passed the hospital, and got on the bridge. One night, I was heading home, and a woman failed to yield turning left on Pacific and hit my motorcycle. I flew over the hood, slid along the ground, and hit the curb – the emergency room curb right in front of the sliding doors. I walked right in and got CAT-scanned and got my finger laceration fixed. That bit of luck was enough to convince me – if there’s a chance of something going wrong, the closer you can be to the hospital, the better! I have a permanently wonky pinky, and that’s all that’s happened to me in a street crash in over 10 years of riding, so I’ll take it! I re-learned to type and moved on. I had a Snell-rated fullface helmet on, and the CT scan and post-crash assessment confirmed that I had no bleeds, no concussion. I threw it away and got a new one. My brain is worth $300-$500 every five years. The one I always think of is one on the Gold Coast, where there was a house fire and a family was badly burned. Literally at the end of the street there was an ambulance station… and all the ambulances were out on calls when their emergency call came through. By the time the next closest ambulance reached them the mother and the children had all died. There was a big outcry about the ambulance being out on call – but seriously, they don’t just sit there hanging around, they do go out for calls, it’s how the system works. Assuming there will be an ambulance local to you at the exact time you need it is a recipe for disaster. I hope the guy was OK – I’d have been tempted to get someone to run to the damn hospital and grab someone on their ciggy break to help. I think people just don’t really think, in that respect. We live 20 minutes from our hospital assuming no/minimal traffic. I went into labor with kid #3 in the middle of the night, so the no/minimal traffic pretty much was the case, except that our exit was blocked off by a zillion cop cars for some reason. We had to use the next exit. I had hubby speeding and running red lights if nobody was around, reasoning if we did get pulled over we had a good excuse! This all wouldn’t have been so bad if my labor hadn’t been 3 hours start to finish. As it was I was terrified I would deliver in the car. Thankfully we made it in time. I don’t understand why someone would seek this experience out. We are done and hubby has made a visit to the friendly neighborhood urologist, but if we somehow did end up having another, I would want to get induced at 39 weeks, because each labor has been progressively shorter and I don’t want to court trouble.